Nature has shown us that it is possible to cryopreserve animals. But with human tissue, each freeze-thaw process causes significant damage. A teenager who tragically died of cancer recently has become the latest among a tiny but growing number of people to be cryogenically frozen after death. These individuals were hoping that advances in science will one day allow them to be woken up and cured of the conditions that killed them. But how likely is it that such a day will ever come? Nature has shown us that it is possible to cryopreserve animals like reptiles, amphibians, worms and insects. Nematode worms trained to recognise certain smells retain this memory after being frozen. The wood frog (Rana sylvatica) freezes during winter into a block of ice and hops around the following spring. However, in human tissue each freeze-thaw process causes significant damage. Understanding and minimising this damage is one of the aims of cryobiology. At the cellular level, these damages are still poorly understood, but can be controlled. Each innovation in the field relies on two aspects: improving preservation during freezing and advancing recovery after thawing. During freezing, damage can be avoided by carefully modulating temperatures and by relying on various types of cryoprotectants. One of the main objectives is to inhibit ice formation which can destroy cells and tissues by displacing and rupturing them. For that reason, a smooth transition to a “glassy stage” (vitrification) by rapid cooling, rather than “freezing”, is the aim. For this, simple substances such as sugars and starches have been used to change viscosity and protect cell membranes. Chemicals like dimethyl sulfoxide (DMSO), ethylene glycol, glycerol and propandiol are used to prevent intracellular ice formation and anti-freeze proteins inhibit ice crystal growth and re-crystallisation during thawing. But it’s not just the individual cells we have to worry about. In a frozen state, tissues are generally biologically stable. Biochemical reactions, including degeneration, are slowed at ultra-low temperatures to a point where they are effectively halted. Nonetheless, there is a risk that frozen structures can experience physical disruption, such as hairline cracks. Then, upon thawing, temperature fluctuation causes a series of problems. Tissues and cells can be damaged at this state. But it also has an effect on our overall “epigenetics” – how environmental factors and lifestyle choices influence our genes – by causing epigenetic reprogramming. However, antioxidants and other substances can help aid post-thaw recovery and prevent damage. Reviving whole bodies also poses its own challenges as organs need to commence function homogeneously. The challenges of restoring the flow of blood to organs and tissues are already well-known in emergency medicine. But it is perhaps encouraging that cooling itself does not only have negative effects – it can actually mitigate trauma. In fact, drowning victims who have been revived seem to have been protected by the cold water – something that has led to longstanding research into using low-temperature approaches during surgery. The pacemakers of scientific innovation in cryobiology are both medical and economic. Many advances in cell preservation are driven by the infertility sector and an emerging regenerative medicine sector. Cryopreserved and vitrified cells and simple tissues (eggs, sperm, bone marrow, stem cells, cornea, skin) are already regularly thawed and transplanted. Work has also started on cryopreservation of “simple” body parts such as fingers and legs. Some complex organs (kidney, liver, intestines) have been cryopreserved, thawed, and successfully re-transplanted into an animal. While transplantation of human organs currently relies on chilled, not frozen, organs, there is a strengthening case for developing cryopreservation of whole organs for therapeutic purposes. Cryopreservation of whole brains is a niche interest at best. Experiments with frozen whole animal brains have not been reported since the 1970s. 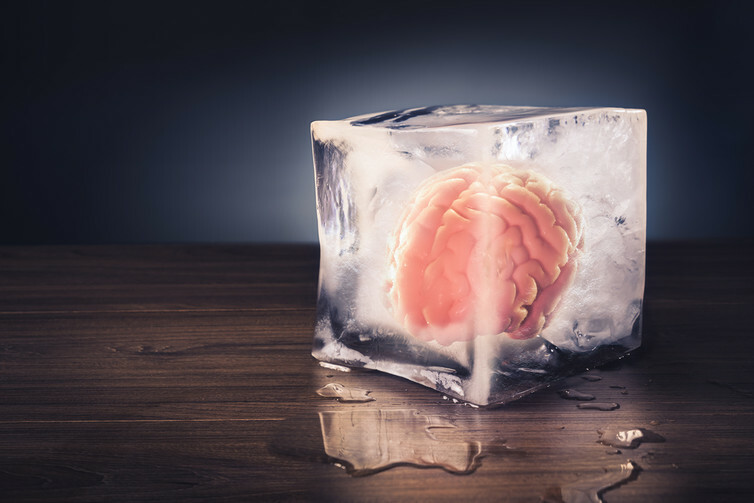 While factors like a good blood supply and high tolerance to mechanical distortion may facilitate brain freezing, particular technical and scientific challenges exist, especially where the goal is to preserve regulatory function and memory. Without huge breakthroughs in such research, it is likely to remain the one factor holding back therapeutic applications of whole-body cryopreservation. But there’s another huge hurdle for cryonics: to not only repair the damage incurred due to the freezing process but also to reverse the damage that led to death – and in such a manner that the individual resumes conscious existence. From a purely technical point of view, this added complication might be worth avoiding. For example, someone who suffers from dementia will have already lost his or her memory by the time they die and will therefore no longer be the same if woken up after being cryogenically frozen. Faced with this, patients with neuro-degenerative disorders who do not wish to live with the condition any longer may therefore seek to be frozen before death, in the hope that they will retain some memory if revived in the distant future. This clearly raises both legal and ethical questions. So will it one day be possible to cryopreserve a human brain in such a manner that it can be revived intact? As explained, success will depend on the quality of the cryopreservation as well as the quality of the revival technology. Where the former is flawed, as it would be with current technologies, the demands on the latter increase. This has led to the suggestion that effective repair must inevitably rely on highly advanced nanotechnology – a field once considered science fiction. The idea is that tiny, artificial molecular machines could one day repair all sorts of damage to our cells and tissues caused by cryonics extremely quickly, making revival possible. Given the rapid advances in this field, it may seem hasty to dismiss the entire scientific aim behind cryonics.